Sushi Jiro is a name that’s appearing here a lot over the last couple of months—and for very good reasons. Home to one of the finest Japanese dining experiences in Singapore, this sushi restaurant located in Marina Mandarin Singapore is one that we find ourselves constantly returning to for a sensorial omakase meal. After receiving such an overwhelming response towards their dinner omakase last month, Sushi Jiro is now making it available for lunch as well! And the deal of a free upgrade for ladyironchef’s readers remains—you enjoy the 8-course omakase at the 6-course’s price of S$180++, and the 10-course at the 8-course’s price of S$220++. This is yet another wonderful chance to experience Chef Kenji’s famous omakase if you haven’t already. Under the lunch set, one of the restaurant’s proudest curations is the Sushi Course (S$100++) and the promotion for our readers is extended—quote ‘ladyironchef’ and you pay only S$80++ for this grand platter. These promotions are available from now until 28 February (excluding 14 Feb 2018). Kicking off the omakase is Shirauo (icefish), a seasonal item that is best eaten between November to March. Served simply with a light soy sauce and garnished with grated radish over top, this dish is a great way to begin the meal with its soft, salty and mildly bitter notes. Right after you down the starter—and we reckon it’ll be quick—what Chef Kenji presents you is an assortment of sashimi comprising Chutoro (medium-fatty tuna), Kinmedai (golden eye snapper), Buri (wild yellowtail) as well as a seasonal special, Sayori (needlefish). A tantalising mixture of flavours and textures, this sashimi platter promises to bring joy to your taste buds from the buttery tuna to the firm and clean tasting needlefish. Whether you opt for the 8-course or the 10-course, the nigiri options will most definitely leave you craving more. Boasting a fine selection of fresh fish, the 10-course omakase comes with all of our favourites from Maguro (tuna), Hirame (flounder) to even the Rolls Royce of tuna, the insanely fatty Otoro. 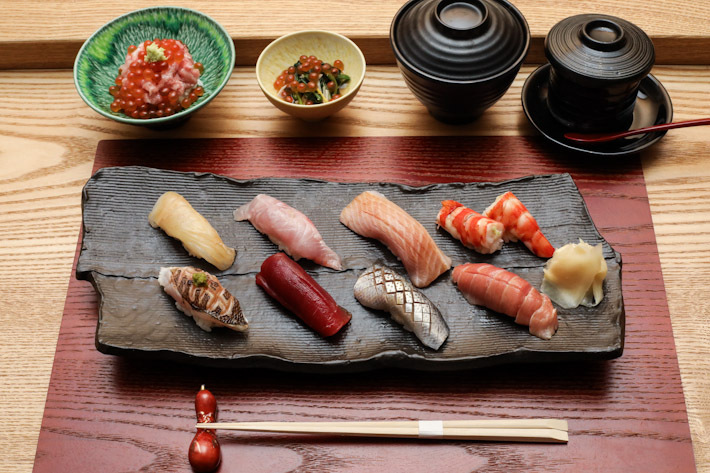 Many of their nigiri options may change depending on the season and you can trust that Chef Kenji makes it his personal commitment to only serve fish that is at its seasonal best. Only available as part of the 10-course omakase, a platter of otoro prepared in 3 ways is one to get you drooling in anticipation. Torched till a slight char develops, the otoro aburi gives off a nuance of smoke and a buttery finish on the tongue. The nigiri version allows diners to truly appreciate the sheer melt-in-your-mouth texture that is otoro and last but not least, the sushi rolls give you a more rounded out flavour with the seaweed providing a backbone of umami. As we mentioned earlier, the menu at Sushi Jiro never remains the same for long, especially during periods of the year where certain ingredients are at their seasonal best. During the spring season between March and April, ark shell clam, firefly squid and bamboo shoots are all ingredients at their peak and are what gave Chef Kenji the inspiration for creating this beautiful creation that sees a combination of the three mixed in a delicate yet umami-packed dashi jelly. Exclusive to the 10-course omakase menu is the wagyu beef. Grilled over charcoal, the wagyu develops a lovely smoky crust that complements the nutty qualities of the intense, beefy flavours exceptionally well. The marbling on the wagyu speaks volumes, not only of the quality of the meat itself but of the quality that Sushi Jiro guarantees. One notable dish to look out for is their signature Ikura and Uni Bowl. Expect a combustion of complex flavours from two highly-prized ingredients—ikura (roe) and uni (sea urchin). Given the insane portion of ikura, every mouthful comes with a salty, pleasantly fishy explosion and the uni possesses a smooth, custard-like appeal that boasts a briny ocean taste. In light of all the rich, briny flavours that have taken up residence on your palate, a good dish to have to wash it all down is the clam soup (only available in the 10-course menu). Made with a base of dashi (and possibly kombu as well), the delicate soup is every bit as comforting as a fireplace in winter. For the 8-course however, diners will get to enjoy the Dobin Mushi, which pretty much features the same soup broth minus the clams. Instead, the Dobin Mushi comes with a variety of ingredients such as chicken and mushrooms. What better way to end a heavy meal than with something sweet? The 10-course features a ripe muskmelon served over ice and the 8-course ends off with ice cream with a red bean cake—both of which are sweet and refreshing. If you find it difficult to have a full-on omakase meal during lunch due to time constraints, consider also Sushi Jiro Singapore’s Sushi Course Lunch Set (S$100++) that consists of a starter, chawanmushi, 8 pieces of seasonal sushi, negitoro and ikura rice, miso soup and dessert. This is our favourite lunch set, yet. 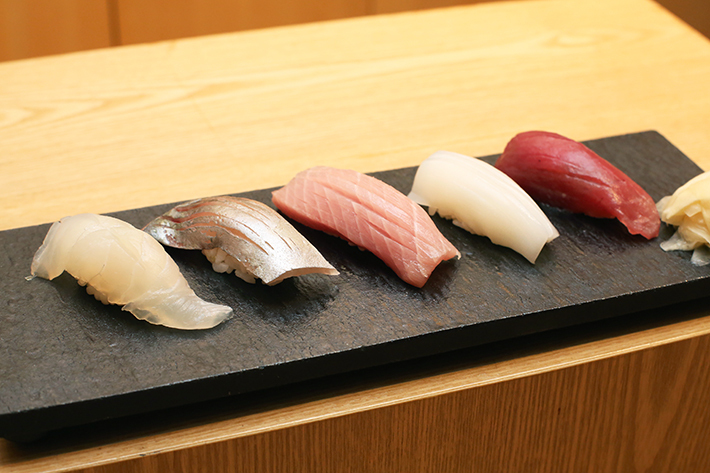 The 8 sushi varieties we had in February were Hirame (flounder), Kinmedai (sea bream), Buri (wild yellowtail), Ebi (prawn), Kamasu (barracuda), Maguro (tuna), Kohada (anchovy) and our personal favourite, Chutoro (medium fatty tuna belly). But do note that the variety might differ because every day’s highlights depend on the fish they import from Tokyo. We’ve shared our love for this Sushi Course Lunch Set a few months ago and many of our readers tried and loved it too. If you haven’t had a go, quote ‘ladyironchef’ to enjoy this set at a special price of S$80++ for the month of February. This post is brought to you by Sushi Jiro Singapore.